Located in the Tarabba sector, Utapau is an old world that fostered a primitive interstellar civilization prior to the formation of the Republic, almost sixty millennia before modern times. The planet had steadfastly avoided galactic prominence during all that time, steadfastly avoiding politics and war with a stance of quiet neutrality. Utapau only entered into notable offworld trade agreements within the last few decades, when offworld water-mining companies had discovered that the waters of the planet were rich in dissolved trace elements said to foster health and longevity. It was in these subterranean levels that the native Utai carved an underground society, while on the surface plains, the taller Pau'ans developed. As climactic changes forced the Pau'ans to follow the water and animals below ground, and avoid the ever-increasing hyperwinds that swept the surface, the Pau'ans and Utai made first contact and eventually established a peaceful and mutually beneficial society. Its windswept surface is dry and desert-like, but deep in the porous crust, at the bottom of the sinkhole are pools of life-giving water. Many of the sinkholes on one of the planet's small continents are lined with intricate cities that stretch deep into caves and crevices beneath the planet's surface. 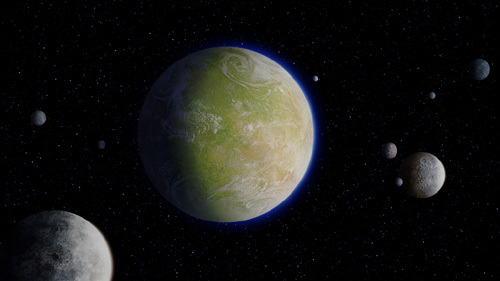 Jedi scholars believed that this once-mythic planet might have been the birthplace of the Jedi Order, millennia before the Battle of Yavin. Other possibilities included Ondus and Had Abbadon.